Cienté salon was awarded a total of FIVE of the prestigious awards by Trevor Sorbie and Joshua Galvin at the Annual Joshua Galvin Training Awards on the 25th April 2006. Cienté salon started working with the Joshua Galvin Training Academy last year and has worked closely with external verifiers and salon assessors to achieved very high standards of excellence within the salon. It is this teamwork & dedication from both Stylists and Assistants that has earned them these awards in such a short time. Stylist Lanica Johnson received a Personal Achievement in Hairdressing Award. On receiving her award, Trisha said “Trevor Sorbie and Joshua Galvin are an inspiration, having been in the industry for 30 years myself I can relate to their passion drive and energy for hairdressing. 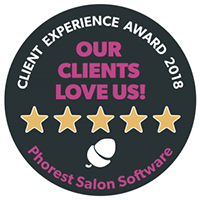 I am delighted that my team have really stepped up to the mark and have really pushed themselves to be the very best hairdressers that they can be – I am immensely proud”. The team at Cienté thrive on ongoing education at all levels and hunger for fresh ideas, so they can deliver a service second to none to their clients.